One of the biggest challenges for gardeners in July is to keep plants hydrated and the soil cool during one of the warmest months of the year in Southern California, say experts at Agromin, an Oxnard-based manufacturer of earth-friendly soil products made from organic material collected from more than 50 Southern California communities. Add Mulch to Save Water, Cool Soil: Add a 1" to 3" layer of mulch around your vegetable and flower gardens to slow water evaporation--by as much as 70 percent. Less evaporation means less watering. Think of mulch as shade for your soil. Because of less exposure to sunlight, the soil stays cool, holds in moisture and keeps plant roots hydrated longer. Add Mulch to Reduce Soil Compaction: Besides its water-saving advantages, mulch also keeps soil healthy. 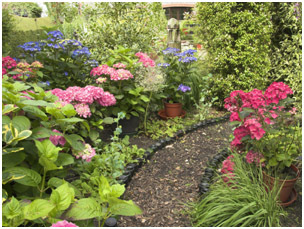 Walking in your garden naturally compacts the soil--to the point that the soil no longer absorbs water well. This can also lead to soil erosion. Mulch protects soil from our footsteps so it remains loose and water absorbing. Don't Over Water: Water thoroughly, not frequently. Watering five minutes a day instead of 10 minutes every other day, for example, means roots become trained to grow close to the surface. The roots will go through a constant wet/dry cycle, which is unhealthy for the plant. Instead, water for longer periods less often. Not only will this reduce water evaporation, but it will encourage deeper root growth. Treat Aphids on Citrus Trees: Aphids can be a nuisance on citrus and other types of trees. Aphids are small black insects that when attached to a tree can curl foliage making the leaves unable to absorb sunlight. They can cause so much stress to the tree, that their damage can affect fruit production. A natural way to remove aphids is to mix two cups water, one cup mineral oil and two tablespoons dish soap and spray the mixture onto the aphids every few days. Planting herbs such as mint, fennel and dill around the trees is known to keep bad insects away. Ladybugs are natural aphid predators so consider buying a bagful at a nursery and letting them loose in your yard. Pick Vegetables As They Ripen: Tomatoes, peppers and zucchini should be ready to harvest in July. To keep vegetable plants producing for the next month or more, don't let vegetables remain on the plant past picking time. It's still not too late to plant summer vegetables since growing season remains strong through October. Add to Your Flower Garden: There are a variety of summer annuals ready for planting. They include marigolds, petunias, zinnias, cosmos and sunflowers. Once planted, remove dead flowers immediately to ensure constant blooming.